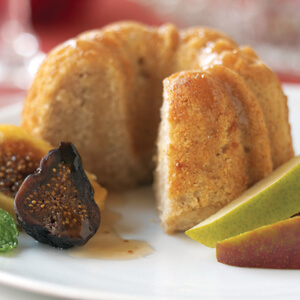 This elegant pear dessert was developed by Chef Asher Miller of AZ Canteen in Minneapolis, MN. Peel pears, leaving stem and a little skin around tops. In a saucepan just big enough to fit 4 pears, add wines, sugar, bay leaves, peppercorns and vanilla pod; bring to a boil. Add pears and a little water if needed to completely immerse them. Reduce heat, cover and simmer until pears are just tender. Cool pears and liquid separately. Return pears to liquid and refrigerate until chilled. To serve: Remove pears from liquid and pat dry with paper towel. Cut bottom of pears if needed so they sit straight on plates. Using a melon baller or paring knife, core pears from the bottom, make a small hole for the crème brulée. 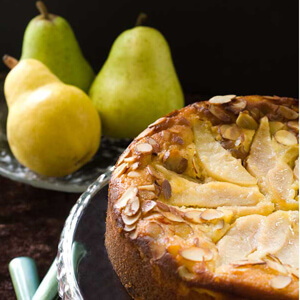 Fill pear with a spoonful of crème brulée and place on serving plates. Sprinkle a little granulated sugar over pears. Using a torch, caramelize the sugared pears. Drizzle with ginger syrup, garnish with mint sprig and candied ginger. Serve immediately passing remaining crème brulée.